I just finished sending a bunch of cards to Unity for the troops. And now I'm committing myself to another self imposed quest. I'm going to try to make as many cards as my sick self will let me over the next week or so to donate to Mandy over at Limelight. The cards will be going to children with cancer. Since all these cards will be going to kids, I get to have WAY more fun! There will be BRIGHT colors, lots of texture, and GLITTER. Well, for the girls cards at least. I can't wait! I wish I had more princess-y little girl stamps, but I don't since I have a little guy. Anyhow, if you'd like to join me in making cards for the kiddos, which I think everyone should, then go on over to THIS post on the Limelight blog and read up on it. Hopefully, we can use our skills to bring smiles to the faces of the kids in the hospital. If that's not a hug for your heart, I don't know WHAT is! 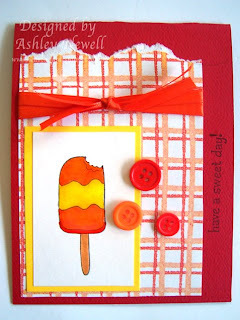 what a fun card--and a great reason to make it! Fun! Thanks for the info! This card is so sweet and yummy!!! I love these colors, and what a great cause! I love how bright and cheery your card is. Adorable Ashley!